Home / Android / Apps & Games / Reviews / Google Keep Android Review - Take Notes on the Go! 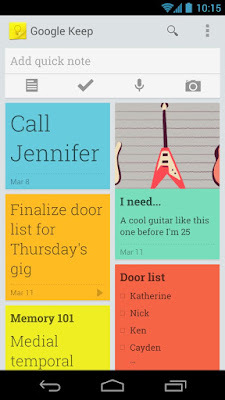 Google Keep Android Review - Take Notes on the Go! Google Keep is an Android app which can be used for taking notes, for creating checklists etc. With this app you can quickly note what's on your mind and recall it afterwards anywhere. You can create checklists of all the Important things and use it when you go for Shopping. You can create a list of stuff you need to pack when traveling. You can snap a photo, add voice note etc. You can sync your Google keep with Google account and can access your notes on Desktop or any other device. Takes Notes, Create Lists and Access them whenever you want. Color code notes according to the priority. Home Screen widget for easy access. Sync notes to access them from other devices. Swipe to archive things you don't need. The Only disadvantage of Google Keep which I came across yet is That it is only available for Android users. I hope Google will soon release the app for other platforms, Till then Android users can enjoy the app. The the name is associated with Google then you should never ask Why, Just kidding! Google Keep is an amazing app which proves to be useful in daily life. You can take notes and recall them whenever you need. 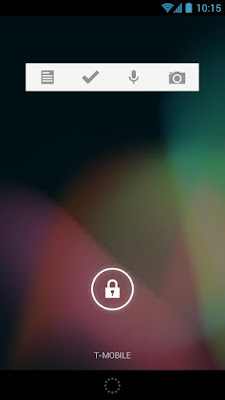 You can use the Home screen Widget to get a glimpse every now and then. Google keep is just awesome and it is definitely worth a try, If you're still not convinced then take a look at the below video, It will explain you way better. So After watching the above video You must be thinking How to get Google Keep then let me tell you, You can get Google Keep for Free from Google Play Store or just go to the below link. Do I recommend Google Keep? Of course I recommend Google Keep. From all the apps I tried, Google Keep was the best (according to my needs), I love google keep and I recommend everyone to give it a try. I hope this article was helpful, Please leave your comments below and let us know what you think about Google Keep.